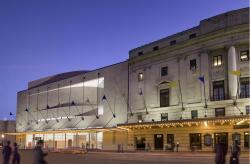 Classical 91.5 spotlights the opening of Eastman Theatre's new wing with special interviews all week long. On December 6, the Eastman School of Music will celebrate the opening of its new east wing with a week of tours, lectures and music. The new wing includes the Wolk Atrium, the Hatch Recital Hall, and the Chihuly glass sculpture. Classical 91.5 joins in the celebration by presenting special interviews with individuals connected to the theatre and the new wing. On Monday, December 6 at 8:35 a.m. you'll hear excerpts from Bob Smith's interview with Eastman School of Music Dean Douglas Lowry, who was a guest on 1370 Connection on December 3. Tuesday, December 7 at 8:35 a.m. Classical 91.5's Julia Figueras talks with Jamal Rossi about the acoustics of the new Hatch Recital Hall. And, at 12 noon on Tuesday Julia interviews cellist Steven Isserlis, who will have performed with Jeremy Denk that evening at Kilbourn Hall as part of Eastman School of Music Festival Week. On Wednesday, December 8, airing sometime between 8 a.m. and 9 a.m., Julia speak with glass artist Dale Chihuly about how he designed the "Blue and Gold Chandelier,"for the Wolk Atrium without having seen the space in person. On Thursday, December 9 at 8:35 a.m. Classical 91.5's Brenda Tremblay speaks with Christopher Seaman about the RPO's interpretation of Handel's Messiah, which will be performed Thursday, December 9 and Saturday, December 11. And, on Friday, December 10 at 8:35 a.m. Brenda talks with conductor William Weinert about the Eastman-Rochester Chorus' participation in a showcase concert celebrating the dedication of a new wing and new recital hall that evening. Eastman-Rochester Chorus is one of three ensembles performing. If you don't have a chance to attend the Eastman School of Music Festival Week events and see the new wing, you can tune in to WXXI-TV/HD on Monday, December 13 at 8 p.m. for a special edition of Restoring a Masterpiece: The Renovation of the Eastman Theatre, which unveils new footage that highlights the new wing. The 30-minute companion piece, entitled Restoring a Masterpiece: The Vision Realized focuses exclusively on the new additions, and includes interviews with community leaders. To learn more about the broadcast, click here.